Sophie Sanders is a senior at Lakewood High School. She is a part of many different sports teams. In the fall season, Sophie runs on the Lakewood Cross Country team. 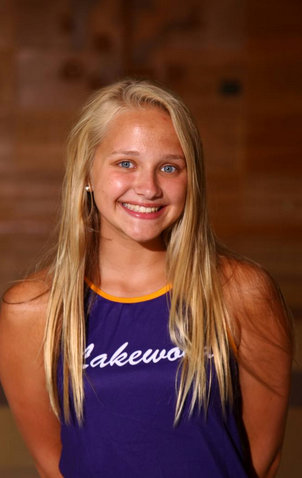 In the winter season, she participates in both the Lakewood Diving team and the Lakewood Indoor Track team. Finally, in the spring season, Sophie runs distance on the Lakewood Track team. Question: How many long have you been running for Lakewood High School? Answer: I have been a part of both Cross Country and Track since my freshman year, and I ran in middle school too. Question: What personal record are you most proud of? Answer: I am really happy with most of my P.R.s but, I would have to say I am most proud of my mile time in Cross Country. It is a 5:42. Question: Which season is your favorite to be an athlete in? Answer: I love all of them, but if i had to pick it would have to be Cross Country. The team is amazing and we are like a big family. I am definitely going to miss it next year. Question: What are your goals for your senior year? Answer: I really want to make it to the regional track meet. I also want to get my mile time down to 5:20. Question: How many letters have you earned? Answer: I have lettered all four years that I have ran on the cross country team. I hopefully will also letter this year in indoor track. If I do, I will also have lettered all four years on that team.